Born in Cuba into a family of doctors and currently living and working in Seattle, Washington, Tatiana Garmendia was raised a devotee of Santeria - a mix of Yoruba mysticism and Spanish Catholicism. She describes growing up in a household where the human body, in various disguises of dejection and exaltation, was a primary theme in devotional and medical imagery. As an artist, her exploration of the human form is based in remembered experiences, juxtaposing scientific certainty against invisible realms, both mysitcal and physical. The painting at left conjures an x-ray like image of the human skeleton. 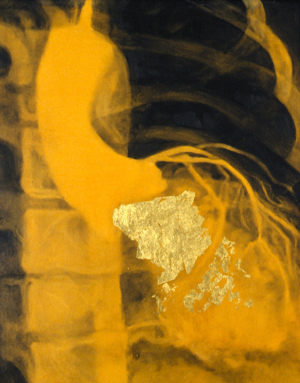 The familiar image of an x-ray is challenged, however, by bright color and alayer of gold leaf, allusions to the rituals and arifacts of her childhood religion.